For home loans, they offer two variations – the fixed EMI repayment loan and the unique Step-Up Home loan which allows repayments in phased gradually increasing amounts, thereby making it possible to purchase a home earlier in life. The I&M Step – Up Home Loan is designed to meet a wide range of needs such as purchase of property, undeveloped plot, construction, renovations etc. With the unique step-up option available with this facility, you can choose to pay lesser monthly repayments in the initial years and higher amounts in later years, thereby matching your repayments to your future growing income. Their vehicle loans also complement their range of personal loans and are offered mostly to existing customers. Car loans are offered to purchase vehicles. The loans are given for a maximum period of 3 years. Car loans are given for 70% of the purchase value/AA valuation and for vehicles that are less than 5 years old. Interest rate charged is on a flat rate basis. They extend business loans, in the form of overdrafts or term loans, after detailed consultations with you. This ensures that the facility given to your business is the most appropriate and cost-effective for its purposes. 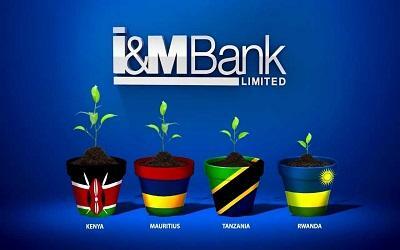 Loans and overdrafts are available in Kenya Shillings as well as in other major currencies.